Background behind Kevin M. Weeks’ crime fiction book collection titled The Street Life Series. The books listed are (1) Is it Suicide or Murder?, (2) Is it Passion or Revenge?, and (3) Is it Rags or Riches? The Street Life Series: Is It Suicide or Murder? The debut novel in the book series is titled The Street Life Series: Is It Suicide or Murder? 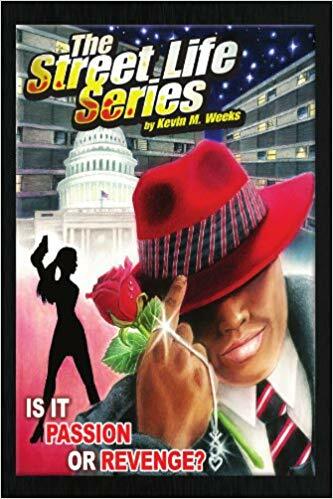 This novel was penned by Kevin M. Weeks in Augusta, Georgia and published in September 2006. Is It Suicide or Murder? is categorized as an urban crime fiction novel. The setting takes place in the Philadelphia, Pennsylvania area, to include Norristown and Conshohocken. The main character Teco (pronounced tea-co) Jackson is introduced in this book. Weeks recalls conjuring up the name Teco out of thin air while hoping that one day the name would become so popular that families would name their baby boys Teco. A suburban reader, who was new to urban crime fiction, jokingly said, “Teco is bad, but I can’t put the novel down.” As a result of Kevin M. Weeks’ storytelling ability, he received the following awards and recognition for The Street Life Series: Is It Suicide or Murder? The STreet Life Series: Is it Passion or Revenge? The sophomore novel in the book series is titled The Street Life Series: Is It Passion or Revenge? This novel was penned by Kevin M. Weeks in Chester, Georgia and published in January 2008. Is It Passion or Revenge? is categorized as a crime fiction novel. The main character Teco Jackson meets statuesque and quick-witted female Detective Hanae Troop, who Library Journal Book Reviewer Rollie Welch calls a “cops cop.” In addition, Kevin M. Weeks' love for stage performance and music shines through in this novel. The setting of the story takes place in the Washington, D.C. area, to include P.G. County Maryland. After reading the second book in the series, readers ask, “When is Teco Jackson coming to my town?” Weeks commits that each novel in the series will take place in a major city across the globe. For Weeks’ storytelling ability, he received the following award and recognition for The Street Life Series: Is It Passion or Revenge? The Street Life Series: IS IT RAGS OR RICHES? The third novel in the book series is titled The Street Life Series: Is It Rags or Riches? This novel was penned by Kevin M. Weeks in Chester, Georgia and published in October 2009. Is It Rags or Riches? is categorized as a crime fiction novel. The setting takes place in Atlanta, Georgia; and the landmark king and queen towers in Sandy Springs are symbolic of the chess game of life.